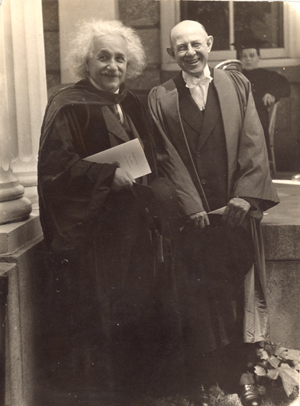 Albert Einstein and President Frank Aydelotte in 1938. Pictures of two “practical visionaries” stand watch over my office here at the College. The first is of Lucretia Mott—Swarthmore founder, leading abolitionist, organizer of the landmark Seneca Falls Convention, gifted preacher, devoted wife and mother of six, and tireless organizer for causes in which she believed. Lucretia Mott is revered as the progenitor of women’s political advocacy and social action in this country. In the large portrait that faces my desk, she appears incredibly somber, even stern. But I know from her biography that while she was a good Quaker, this serious image fails to convey her passion, humor, intellect, friendliness, and ability to apply knowledge to realize her practical vision for an equitable and just world. These two pictures remind me—and all who enter this space—what Swarthmore is essentially about. For Aydelotte, it’s a rigorous education that, among other things, enables people to soar—to graduate schools and careers, equipped with creativity, confidence, and the ability to see new possibilities and solve problems, regardless of their field of endeavor. For Mott, it’s education for the common good—values that ground and challenge us, even as the expression of these values evolves. As we celebrate our sesquicentennial, I find myself imagining what these two guiding figures, my anchors and polestars, would say if they were to speak at a 150th anniversary celebratory event. 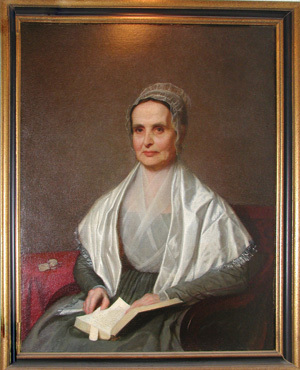 A portrait of Lucretia Mott by William Henry Furness Jr., similar to the one in the president’s office. Lucretia Mott: I am gratified that Swarthmore remains skeptical of claims that come too easily, glad that it questions all “deeply held beliefs,” and rejects “truth” that is based simply on authority. I like the seminars that challenge biases; I like debates in dining halls and libraries. Our “perfect College” accepts no political, religious, or intellectual orthodoxies. I was subjected to violence when in 1838 I walked arm-in-arm with African-American women in the streets of Philadelphia, so I’m pleased to see so much diversity among students, faculty, and staff. The College waited too long to become a racially diverse community, especially since it was open to women and all social classes from the beginning. Yet the Swarthmore community needs even more persons of color, from even more diverse backgrounds, reflecting an even wider spectrum of beliefs. You must keep educating students to build communities in which everyone has access to education and employment and, as I maintained in the mid-1800s, where there is equal pay for equal work. Also, I beseech you, preserve the wonderful commitment to what you have labeled “need-blind admissions.” I heartily endorse the many approaches to civic and social responsibility. I applaud the Lang Center for Civic and Social Responsibility, which reaches out locally, nationally, and internationally to ameliorate suffering. I see other places on campus where knowledge is being used for social improvement and justice: a course in statistics that helps nonprofits, a course in prisons in Chester and Philadelphia, and the Evans Scholars program. Swarthmore’s involvement in Chester’s schools is important on many levels. Please keep asking what we can do better, and please remember that we Quakers also cared a great deal about making sure commerce was conducted ethically and that moral men (and, today, women) provided civic leadership. Thus, I also applaud the Center for Innovation and Leadership. Times have changed, but I encourage you to study Quaker values, hold them dear, and argue them intensely. Adjust them as need be, but stay focused on simple living, integrity, generosity, peace, and the amelioration of suffering. Without these fundamental values, we would not be Swarthmore. Frank Aydelotte: It appears the Honors Program has succeeded not only in supporting the true ends of education—beauty, truth, goodness—but also in helping to secure Swarthmore College’s reputation for academic rigor and creativity. I am deeply grateful for your support for the intellect and pursuit of these virtues. When we began our experiment in honors, we were trying to “make Swarthmore College conscious of itself and of its opportunity for service to American education.” Today education is again subjected to a great flood of criticism. I worry that you—faculty, alumni, president, and others—are not sufficiently aware of the urgent need to address these pressing problems. Our country will not prosper without a rigorous and creative approach to education. Your approach will differ from the one we undertook in the 1920s. Today we must all be revolutionaries. We need to make sure our education is challenging, imaginative, and accessible to all students who want to pursue this challenge. We must revolutionize the world of education in this day of technology, globalization, economic challenges, and dangers to the survival of the earth itself. That the Honors Program has changed does not surprise me. The goal of attracting and supporting incredibly bright students remains, and I see that the College is doing this in multiple ways. Given that so many colleges today are “academically adrift,” I am gratified that Swarthmore insists that it recruit students with intellectual passion and pleased that it defines “intellectual” far more broadly than we did nearly a century ago. I applaud the continuous emphasis on recruiting the finest faculty and supporting their intellectual development. After all, students benefit when faculty are, what I termed, “intellectually alive.” Your Institute for the Liberal Arts, with its Rhodes-like spirit, seems a perfect way to support the intellectual life of faculty across disciplines and to cultivate intellectual interests in an era when the contours of knowledge and teaching are changing so dramatically. Even as I acknowledge Lucretia Mott and Frank Aydelotte as two of the College’s most significant and enduring inspirations, I am mindful that Quakers do not venerate people as saints but rather cherish the memory of Friends who lived in the light and did well in their times. We must remember that if we do no more than our ancestors have done, we cannot progress. With this in mind, I invite you to use this sesquicentennial year to create a Swarthmore “cloud of witnesses.” Please tell me who in Swarthmore’s past or present is your guide (teacher, friend, founder, dean, etc.) and tell me how you imagine that person would evaluate the College now as we celebrate our sesquicentennial. Write to me at president@swarthmore.edu, and we will share your testimonies on the sesquicentennial website, www.swat150.swarthmore.edu.